To go from the bizarrely sensational Wycliffe Well, UFO capital of Australia (if not the world! ), to the magnificent grandeur of the Northern Territory’s Devils Marbles is to go from the ridiculous to the sublime. A few hours on the road north from Alice Springs, exploring the weird and wonderful Wycliffe Well after parking in the Elvis campsite, then a few kilometres north to see the Devils Marbles by sunset gets pretty close to a day that can’t be topped! Actually, yes it can – a meal at the Galaxy auditorium back at Wycliffe Well followed by the first episode of a new Dr Who series could round the day off nicely … but I digress. If you can fight your way through the other sunset photographers (well … god gave you elbows, right? 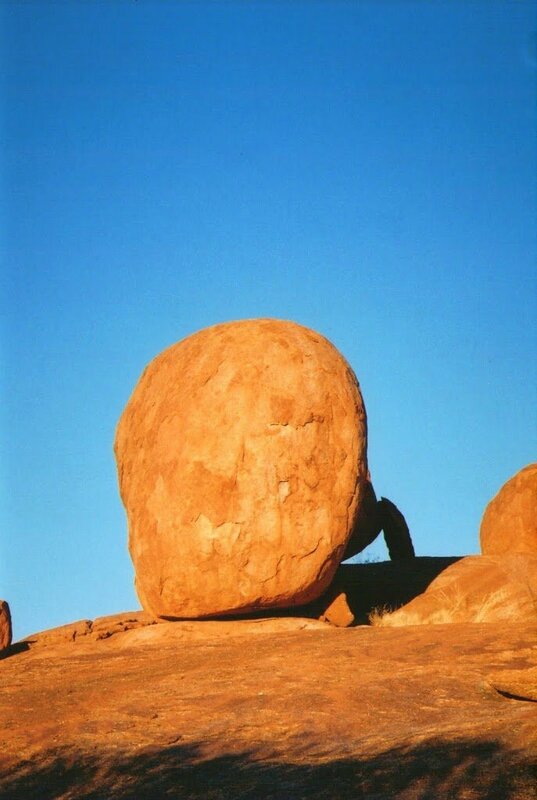 ), the Devils Marbles give amateur photographers (yes, that’s me!) with an unparalleled chance to take shots that look like they were taken by someone else good. It’s one of those sadly all too rare places where it’s almost impossible to take a bad photo. Wisps of cloud during our first visit in May 2008 gave the sunset panorama an oil-painting quality – and against the unbelievable colours of the rock as the sun went down, the white cloud against blue sky was breath taking. Known as Karlu Karlu*, and sacred to local Aborginals, the site was returned to the traditional owners in October 2008. The conservation reserve is accessible to day visitors, but hell! Stay in the campground, with those FAAAAABULOUS public toilets, for a chance to take both sunset AND sunrise shots! But how did they come to be here in the first place?? Glad you asked!! The Devils Marbles were originally rectangular blocks caused by molten rock cooling under a sandstone layer. As the sandstone eroded, water, wind and sand formed the rocks into the shape with the smallest possible surface area – the sphere. And here we see in action the great divide between science and art – this explanation seems just a little too prosaic for a place so magical, doesn’t it?? Perhaps that’s why the Aboriginal Dreaming story of the Rainbow Serpent, who after creating the earth, returned to a place where the rainbow meets the earth. The Rainbow Serpents fossilised eggs have now become what we know as Karlu Karlu* or the Devils Marbles. Now – isn’t that a far more satisfying explanation? My Lord Howe Island Triathlon! Love the photos, Red! Guess we were there “pre-loo-time”! At least we cannot remember a loo being there back in 1999 (buhu, that IS a long time! )… I would´ve managed without elbows, kinda, too (still glad to have them, ha-ha). You’re probably right about the loo, Iris! It doesn’t look that old!! Maybe you need to save up for a 20 year anniversary re-visit!!! @kiwivic – welcome and thanx!! Look forward to sharing more adventures – and reading about yours!! Red, thanks for your comment, we clearly share the same travelling soul! I love your photo’s, you absolutely capture the look and feel of OZ, and you sound like you are having a ball! @bettyl – Wow! I’d like to see the Split Apple! I’ve had people tell me these rocks almost look fake! @SFlaGuy – In virtual blogland, nothing is too far away! @Linda – Welcome! You’re right – just appreciating the rocks for what they are is more important than knowing everything about them. Some things are just meant to be mysteries! Rocks are so cool and these are absolutely beautiful wherever the heck they came from. Great photos. I would love to see a closeup of the split rock. I hope you have a photo as it’s a bit of a drive from Florida. Those are some amazing photos! There is a rock in NZ similar to your second shot called ‘Split Apple Rock’ and I had some folks tell me it looked fake! @Carolyn – Lucky you like rocks; there’s a helluva lot of them about down here in OZ!! @River – You got that right, girlfriend!! @PDP – some people say I’m obsessed with toilets, but I don’t believe them!!! Thanx for the kind words!! @Pinay Travel Junkie – Welcome! The outback’s great – don’t worry about the cold!! Come back anytime!! Such fascinating marbles! Can’t wait to head to the outback… but then it’s bloody cold right now 🙁 My first time here, love your posts! Yup, what can I say, love it….!! You do write one heck of a good story Red, and yes I’ll go with the ‘dreamtime’ story too, much more romantic. Haha! the fantastic ‘toilet’ story lives on!! I love huge boulders and the Devil’s Marbles are some of the best. Great photos I like all rocks. @Alessandra – Maybe your dad was right and the best rocks ARE in Italy! But I’ll settle for these until I see for myself!! @Windsmoke – Haha! Maybe you’re right!! @Sailor – Glad you like them! It’s almost like they were taken by an actual photographer, not just me!!! @Courtney – Ah c’mon! Just admit you REALLY want to visit the UFO capital of OZ/the world!!! @Andrew – The Dreaming is WAY more poetic!! I changed my blog name when I changed the template a few weeks ago – but may change it again, not sure if I’m happy with it! @Aleah – ALL sizes! The bigger ones (like my sunrise shot) would be several metres in diameter, others a metre or so. I’ll see if I’ve got a pic with people in it for perspective. Beautiful Pictures. They look like some real amazing canvas paintings. Look how cleanly the rock in the 2nd photo is cut in two as if struck by an axe or a meat cleaver. I reckon they are called the Devil’s Marbles because the devil lost a game of marbles spat the dummy, went home and left them all behind for us to enjoy :-). When I see images like these I think of my dad and how he liked rocks, If he saw a nice rock or stone e would touch it and admire it and talk about it for ages. When he saw a stone wall he could tell which kind of stones they were and all the differences. Of course being who he was he thought that the best stones were in Italy and in my travels every time a met a good rock I though that it would have been nice to introduce it to my father. He made it to NZ, and it was enough to give him a larger perspective of the world, but never Australia and it is a pity because you have some amazing rocks there, and I really wish that he seen them. And me… I have been to Australia a few times, but never seen anything like it, and still have to go to the big one :-0!!! This is one of the places I have really wanted to go and see, really amazing I feel, maybe one day we will get there, it certainly is on the bucket list. Beautiful! And how unique looking. Would love to see these (or really, any part of Australia) one day! Yeah, I will wear the Dreaming. Could have happened several thousand years ago. Who knows what went on then. You’ve changed you blog name? Or have I just noticed it?